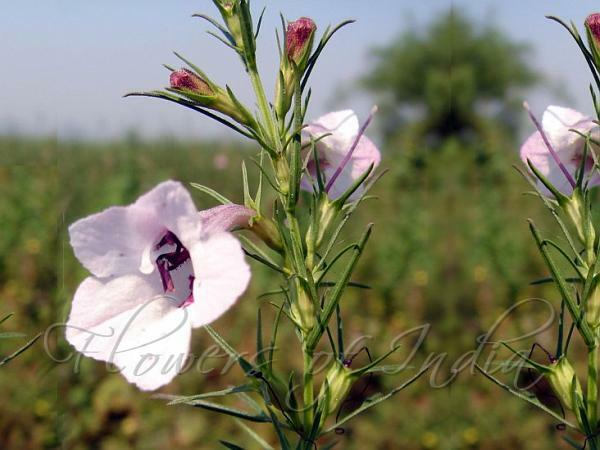 Common Sopubia is a widely found root-parasite herbage in India. Its juice is reported to possess healing properties for sores caused by moisture and is also reported to be an abortifacient. Erect herb, stem grooved, branched, spotted with purple. 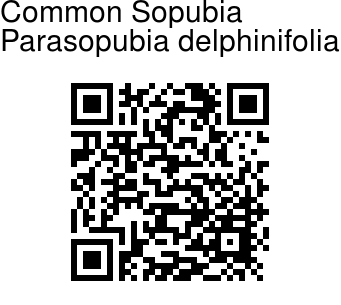 As the name delphinifolia suggests, its leaves are like those of Delphihiums. Rosy white trumpet shaped flowers with long necks, appear along the stem. It is common in moist grasslands. It is distributed in Western Peninsular India, Sri Lanka and Shimoga. Flowering: August-January. Identification credit: Pravin Kawale Photographed in Alibag, Maharashtra.